American DJ Majestic LED Moonflower Effect DJParts - All Variety of Parts that DJ Needs. 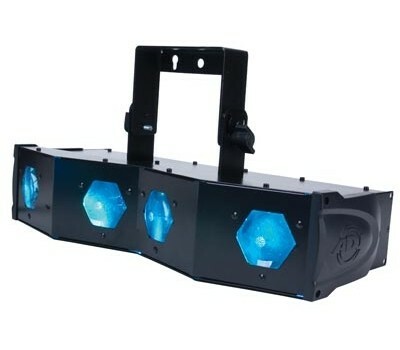 • Great for aerial effects over a crowd or projected on a wall, ceiling or floor • 184 total 5mm LEDs : 64 Red, 60 Green and 60 blue • 2 DMX Channel Modes (2 Channel mode or 8 Channel mode) • 4-Button LED DMX Display • Linkable via XLR connections • Wide beam spread covers a large area • 3 operation modes: DMX, Sound Active & Master/Slave • Sound active from built-in programs • Strobe function • Beam angle: 56 degrees • Runs extremely cool! - No Duty Cycles! - Run all night! • Includes hanging bracket • Power Consumption: 19W maximum • Extreme long lifetime of the LEDs (100,000 hr. rating) • In/Out IEC power connections to daisy-chain power • Multi-voltage Operation: AC 100-240V, 50/60Hz • 1/4” input for optional American DJ UC3 remote control (sold separately) • Dimensions (LxWxH): 21.5”x8.5”x7.75” / 542x215x194mm • Weight: 12 lbs. / 5.1 kg.